Rahm Emanuel's major donors include some of the same people who recently tried to get the Illinois General Assembly to approve a legislation called "Performance Counts." The same big money people who are bankrolling the group called "Stand for Children" are also putting most of their campaign cash into the coffers of Rahm Emanuel's candidacy for Chicago mayor. Hyatt Hotel billionaire owner Penny Pritzker (above right) not only served as Barack Obama's 2008 campaign finance chief (helping Obama raise the largest amount of campaign cash in history), but got Obama to drop his support for the "card check" approach to union organizing, when her Hyatt Hotel interests were threatened, despite Obama's promises to the AFL-CIO. 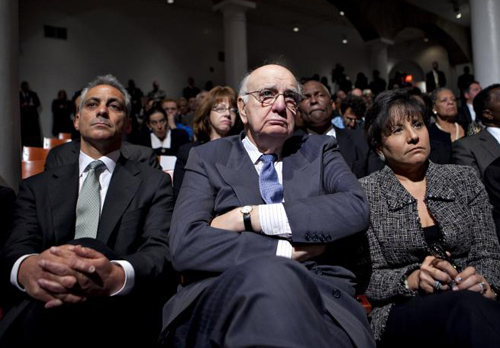 Above, Pritzker sat with Paul Volker (center) and Rahm Emanuel (left) during an Obama speech on Wall Street. Penny Pritzker now supports Emanuel's candidacy for mayor of Chicago and has helped Stand for Children raise more than $3 million (including $50,000 she donated herself) for its PAC fund to undermine Illinois teacher unions.As a recent report from one of the most factual news services in Springfield points out, Stand for Children, which didn't exist in Illinois five months ago, is now the best funded political action committee (PAC) in the state, having gone from zero to more than $3 million in its coffers thanks to a handful of Chicago area millionaires and billionaires who donated as much as a half million dollars to Stand for Children just before Illinois law changed putting a cap on the donations. The same billionaires and millionaires are bankrolling the Rahm Emanuel campaign for mayor or Chicago. One of those who made a major contribution to Stand for Children (Tribune corporation's Sam Zell, who donated $100,000 to Stand for Children) also puts out the supposed surveys that show Emanuel as the leading candidate for mayor (via the Tribune - WGN polls). Capitol Fax, a newsletter covering Illinois government, published extensive information about these issues based on public records on January 21, 2010. Their material is copyrighted, according to the owner, so he requested that it not be reproduced here, and we are honoring that. Substance has also verified this information from public records independently of Capital Fax. The way the money came in, it is clear that James Crown, the current most visible public face of the billionaire Crown family of Chicago (Materials Service was the beginning of the Crown fortunes) did the calls that enabled Stand for Children to donate more than a half million dollars to Illinois politicians during the final weeks before the November 2, 2010 election. That $600,000 went not only to help elect some candidates, but to establishing Stand for Children as one of the best financed "education reform" groups in the USA. And it was all done by a half dozen people, led by some of America's wealthiest individuals. James Crown (President, Henry Crown and Company), $50,000 on September 27, 2010. Paul Finnegan (Co-CEO, Madison Dearborn Partners), $200,000 on September 29, 2010. Matthew Hulsizer, (CoFounder/CEO", PEAK6 Investments), $100,000 on September 27, 2010. George Ruhana (Partner/CEO Options House LLC), $26,000 on September 27, 2010. Leo Smith (A charter school teacher at Perspectives Charter Schools), $25,000 on October 12, 2010. Nearly $3 million additional cash was funneled into Stand for Children in December 2010, at the time the group was preparing for the Illinois "School Reform Committee" hearings and to get their "Performance Counts 2010" legislation through the Illinois General Assembly's lame duck session in December 2010. The December money came in from families (Pritzkers put in $300,000; Crowns more) and several wealthy individuals (Sam Zell, who helped destroy the Tribune, put in $100,000). Despite the dollars and the intense pressure, "Performance Counts" did not become law. Originally, Substance reported the information as provided to the public by the publication "Capital Fax", but their owner Rich Miller called and screamed so, we took down that set of quotations (albeit attributed) and verified the information from public sources on our own. 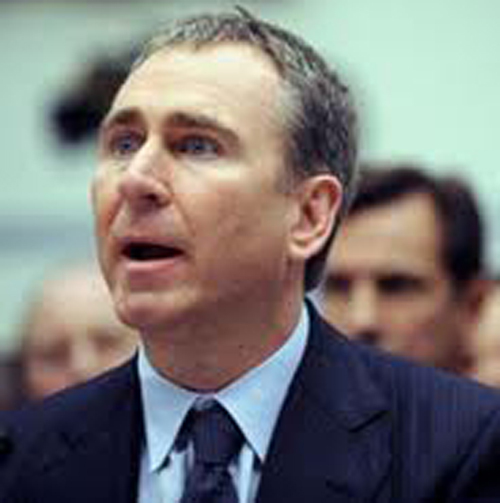 Chicago Hedge Fund billionaire Ken Griffin has contributed to the Rahm Emanuel campaign and wrote a check for a half million dollars to Stand for Children's PAC just before the December 31, 2010 deadline.Those who wish to subscribe to Capitol Fax can contact it directly: CAPITOL FAX, "Political Intelligence", by Rich Miller, Voice 217.529.6811 Fax 312.276.8439 capitolfax.com capitolfax@aol.com. The editor of Capitol Fax, Rich Miller, informed Substance on February 1 that his material is not to be reproduced or forwarded in any form. As always, Substance shows us why even those of us in Vermont need to watch the Chicago news carefully. For decades, Chicago has been the leader in school deformation. Now, Stand for Children wants Obama buddy Rahm Emanuel to become mayor of Chicago. Watch out, Chicago teachers! And the rest of us had better watch out, too. Ram will release his revenge on the residents of Chicago. The rest of the city will get a long elected taste of how we, under Huberman, suffered. Will not be surprise if Ram hired him back. You read it here first! Since that is the Supreme Court's definition of residency does that mean that a teacher could buy a house in Chicago, rent it out, and keep something in storage saying "someday I plan to return" and meet the residency requirements? I agree that I am more afraid of Ram now then I was before this debate!